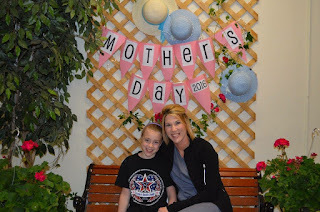 This Mother's Day may have been the best yet! I LOVE all the crafts my kids made me! They beat any gift that money can buy! I started Friday at MC's school doing Muffins for Moms. THey had the is cute back drop set up and took everyone's pictures! And then she gave me my own tea bag so I can "relax in my free time." Yeah.... free time,lol! And my sweet Kinley made me a card and put every sticker that she could get her hands on the card! It's so neat how her handwriting has advanced. And she now makes her Y's the correct way; kind make me miss the old days. And she made me this awesome cake! It tasted as good as it looked!! Oh and my sweet boy made me this sunshine with his little hand prints! Just precious I tell you! lets take some pictures......said NO one year old ever,lol! He was not having it! But my big girls didn't mind! My whole sweet but crazy crew! And of course at least one of them has to be doing something silly during picture time! Not sure how I got this lucky! Our church held an brunch for the babies being dedicated and Nana joined us for the yummy treats! These kids have no idea how lucky they are to have her as their Nana; they truly hit the jackpot! And we dedicated back to the Lord what he has already blessed us with! After church we headed to Nana's to celebrate Creed's dedication, Mother's Day, and My dad's birthday! May 4th 2016: 8 years 8 months old! I can't believe you are 4 months away from NINE years old. Dang, that really makes me feel old MC,lol! You are super busy these days but hopefully all that will settle down as school gets out and we enter into summer time!! You have been begging to go to two church camps this summer. One is just a day camp.......but another is a 5 day 4 night camp. You have only stayed away from one a few times and its never been for more than one day. But you are convinced you can do this can do this overnight camp. Daddy and I are still in the "discussion phase" of these but you already there in your mind. I love that you are growing up and starting to become a little more independent. You can be so shy and such a hermit, but slowly that is changing! You are so cautious and I love that about you! Oh my first born, my first love at first sight! I love you more than anything in this world! You got your LAST nine weeks midterm grades and again you have all A's! You have really worked hard this year and your daddy and I are so proud! Math was your weak point at the start of the year but now you soaring in it! And you where named bucket filler of the week again! I love that you are recognized for you manners! Manners will take you so far in life sweet girl! And you where chosen to play "Mrs. Old McDonald" in your school play and you where soooo excited! You had a ton of lines and your music teacher made you pinky promise that you would talk loud and not be shy and you did it! You did great!!! I could just kisses these sweet, freckled cheeks all day long! And Ms. Macy came to watch you and MG! Saturday you competed in the Andy Allison race and you smoked it!!!!!!!! 1st place by a long shot! I was working on the back side of the race and wasn't sure if you got 1st or 2nd until daddy text me the picture of you on the stand. I was so excited, I was jumping up and down like crazy! Look at that awesome trophy!!!! Last night we had your end of the year gymnastics banquest! You have the best coaches and sweetest team mate. It has truly been a great and fun year! I am so proud of all your hard work MC! You got the "most naturally talented!" I have to admit that about brought me to tears when they called you name out! I hope you realize what a natural talent God has blessed your with MC! Your dad and I love you and love watching you grown, advance, and soar! Creed: One and a HALF! May 2nd 2016: you are no longer ONE........You are ONE and a HALF Creed! Uhhhh. that means that TWO is only six short months away! Oh my stars that just about seems impossible to this momma! I sure wish I could bottle you up and keep you little bitty forever! You are in 2T and some 3T clothes now. You wear size 6 or 7 shoe and your size 5 diapers are getting snug! You still love to say NO! You are starting to put sentences together and it's just amazing! You will come tell me.... Ninley hit hand or Mina (MC) said NO! They get so mad that you tattle on them and it cracks me up! You have learned to spray my hair spray bottle and you think it's the funniest thing in the world; you have to do it every morning! You love for daddy to put deodorant on you too! And you LOVE to have your hair fixed! You say...my hair....gel .....peeeese (please). And you do not like to wait your turn, you want your hair done first! You LOVE school and your friends, and your teachers! Moving you there back in August was the best decision ever! You are spoiled rotten.....maybe even beyond repair,lol! We all love you so much, it's just about ridiculous! Be still my heart.....for this boy has stolen you away! you energy and excitement is infectious sweet thang! And if say sit....you do just the opposite! You are just non stop these days silly boy! you make everything so fun! and you crack up at everything your sisters do......EVERYTHING!!! If only there where words to tell you how much you really mean to me Creed! Welcome to 1.5 my lovie! We had to stop by the Dollar store to grab some oil one night and you spotted these Car crocks and you went nuts hollering CAR CAR CAR! And of course that's all ya had to do and they where yours,lol! You are in LOVE with these silly little shoes. You walk around saying Car, Beep Beep! And you grabbed my Subway cup Wednesday night before I could even stop you and gracious sakes a live did you ever have a blast with that cup and straw! Love this face, you where giving it your all! Just so dang proud of yourself!! My sweet sweet boy! You smile makes my heart cringe with tightness! Till I got this picture! Everyone was looking and wooing and had teary eyes! I know deep down your a momma's boy, so Im gonna let slide this one time,lol! Oh and daddy's hat.....oh my how you love to play with daddy's hat! You are so dang pretty you should have been a girl! My mom sent me a few pictures of my little brother Brent last week and when I saw them come up on my phone my heart just sank and I couldn't hold the tears back!!! My brother and I where both very young when he past away and my memories of him are so few and far between. Creed's whole pregnancy was a surprise and then to be a boy on top of that was even more of a surprise. I knew I wanted to carry on Brent's name so it was perfect to name our son Creed Brentley. I never in my wildest dreams imagined my Brent would be the spitting image of my baby brother Brent. So sweet how God gives you things back in small ways! This was Brent at age 3.......I have no doubt Creed will look just like this in a few years! What a sweet blessing!